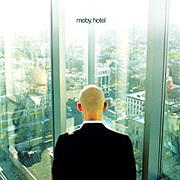 The album Hotel by Moby is available as a single CD as well as (at about the same price) a limited edition double CD; with the included "bonus" CD being called Hotel Ambient (67'52"). With the release of this full-length Ambient CD, Moby again wanders outside his pop music bubble long enough to produce a patchwork of 11 forward-looking instrumental compositions (plus three that are included on the primary pop music disc). With this music, Moby manages to convey both youth and authorial maturity. Ranging from beautiful weightless electronica to works of bounding rhythmic motion, Moby realizes well-constructed forms in an overall formless genre. The music feels gentle, delicate, friendly and misleadingly simple. With its clear phrasing, pacing and feeling, what little tension there is arises out of the complex interaction of sounds and tones. What with their steady unwavering beats, the few rhythmic pieces may seem mechanistic. But Moby's music is far from robotic, as this Ambient music was surely created by an entity with both a heart and a mind. This is music with different layers moving at different rates, wonderfully infused with consonant melodic lines (not just isolated notes). This lean and subdued album seeks to rise above reality rather than escape from it. Once the listener begins to fathom his purpose, Moby's music can then begin to permeate our hearts and spirits in a remarkable way.